Rsyslog is an open-source software utility used on UNIX and Unix-like computer systems for forwarding log messages in an IP network. It implements the basic syslog protocol, extends it with content-based filtering, rich filtering capabilities, flexible configuration options and adds features such as using TCP for transport. 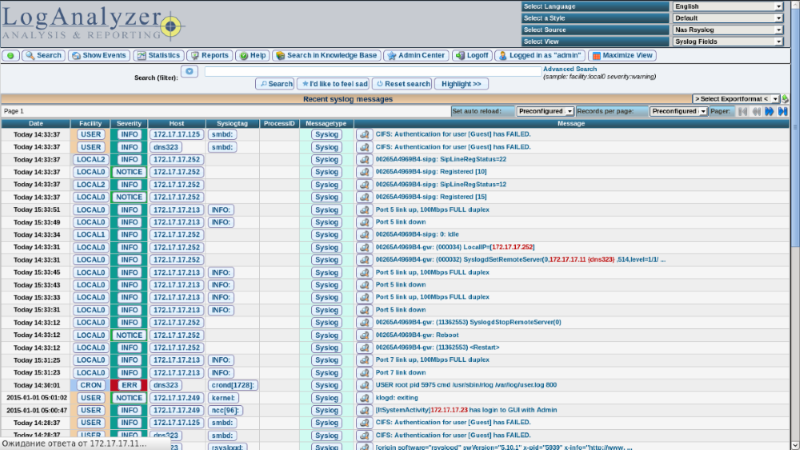 LogAnalyzer project provides an easy to use but powerful front end for searching, reviewing and analyzing network event data, including syslog, windows event log and many other event sources. Download and install the Rsyslog Add-On. Click the link for the Rsyslog web interface and LogAnalyzer configure it. Hoping it is OK resurrecting an old post. I have the syslog and analyzer running fine. The 1 thing I cannot do is get the reports to work, I was trying to get the users report to work. How do I get the V 4.1.3 log analyzer onto the package? appreciated thanks, have to install a file browser. Noticed that the add-on is trying to connect to the Localhost DB (a MySQL one) but I don't have anything like that installed as an add-on... Should I do something else than downloading the package, installing via the add-on manager and going to the Rsyslog page? Let me know if I need to install phpmyadmin or if I need to do something else to get it running.